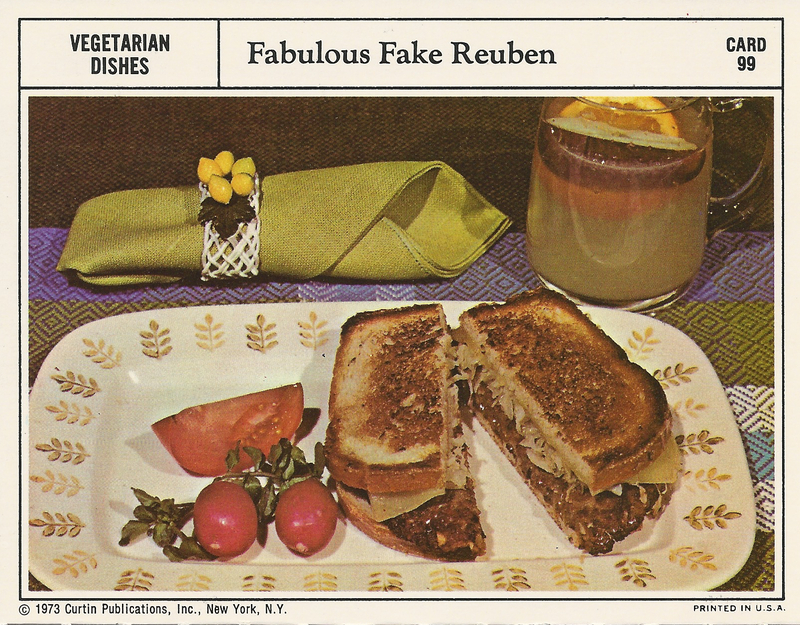 tags: bad food photography, complete family recipe card library, fabulous fake reuben, there's nothing fabulous about this recipe except the judicious use of MSG, vintage recipe cards, wheat germ why? Mix all ingredients except oil, bread, mustard, sauerkraut, cheese and butter. Shape into patties. Sauté patties slowly in oil on both sides. Prepare 8 sandwiches by spreading butter with mustard; fill each with a patty, sauerkraut and a slice of cheese. Grill on both sides in melted butter. Jeeminy Christmas. A pound of corned beef has gotta coast a lot less than all those ingredients. You are kidding, right? Way too many ingredients for what could be a simple sandwich. Like corned beef, swiss cheese, sauerkraut & thousand Island dressing. D’uh!